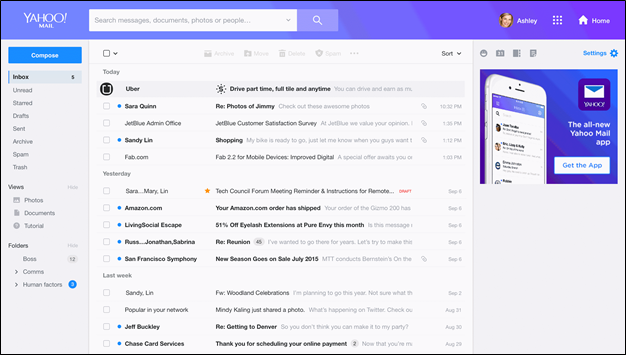 Yahoo Mail today announced big improvements on desktop including a refreshed design, and a fast, reliable, and intuitive opt in experience. Whether you use Yahoo Mail to communicate with friends and family around the world, as a place to keep your photos and memories from years past, or as a way to organize coupons and receipts from recent purchases – your inbox captures your life online. The Mail interface is cleaner and easier to use, with many updates to the layout. Themes: Now you can personalize your inbox by choosing from new colour themes. Each theme also comes with three different layout options. When you find the colour you like, you can also set the interface to a light or dark mode. Less clutter: Now there is more spacing between important items, so your inbox feels less cluttered, and you can easily view and decipher important information. Show your emotions: Express yourself using our new emoji set from Twitter’s open source offering, and with new stationery to make your emails more stylish. Photos and Documents Views: Our new Photos and Documents views allow you to conveniently see all the attachments you’ve ever sent or received. When you want to look at a specific document, use our new side-by-side preview which allows you to view attachments and the email together. Fast and responsive interface: We use the latest web technologies to make your whole experience faster from the moment you login. Every part of the interface is faster and more reliable, particularly for slower connections. Yahoo Mail also behaves smarter in recognizing different screen sizes, no matter how small or how big your screen. The responsive design keeps the key elements of the interface in the right place. To learn more about the modern tech behind this update, click here. Better Search (Conversation and Preview pane): Now you’ll be able to view the search results page the same way you’ve specified in your “viewing email” settings. For example, if you use conversation mode, now the search results page will show results in conversation mode instead of in a flat message list. If you’ve selected your preview pane to display on the right, it won’t move when you’re in the search results page. Rich Preview: Hover over the image icon to view the photos, documents, etc., attached in an email. Simple and easy settings: Too often in apps the settings are an afterthought, making it hard to customize things just the way you like them. You will be happy to see that we put as much effort into making the settings area clean and easy to use, as we did the rest of the interface. So now customizing Yahoo Mail is simple. As you change settings, the interface responds instantly, so you don’t have to guess, save or cancel your changes. Enjoy Yahoo Mail Pro: A few years ago we introduced Ad Free Mail, giving you the option to opt into a completely ad-free Mail experience with the purchase of a yearly subscription. Now, we’re improving this offering with Yahoo Mail Pro, a more cost-effective ad-free subscription plan that comes with priority customer support. Available now on both desktop and mobile. Read more about Yahoo Mail Pro here. Choose the inbox that suits you best: While we hope you’ll love the new desktop experience, if you opted into the new Yahoo Mail experience and want to switch back to classic desktop Mail, you can always go to Settings and select “switch to classic mail” at the bottom. We want to ensure that all our users can enjoy our upgraded email experience. We’ve incorporated full inbox access for NVDA and VoiceOver screen reader users, and provided options for light-sensitive and low-vision users, layouts for use with high magnification, and full keyboard navigation for alternative input devices. To learn more about these improvements, visit our Accessibility blog post here.